“Homes for Sale” if you are in real estate sales. Try not to be too broad using a 1 word phrase. Then choose a larger city close to your place of business. Most people use a geographical term like Philadelphia, Sarasota County or a zip code when they search. Know that it is much easier to get found in your home town so consider a city close by. Enter the keyword phrase in the first field and the city near you in the next. Then enter the URL for the page you want to look at (i.e. https://e-xplorations.com/seo/). Then click the button “Show Me”. 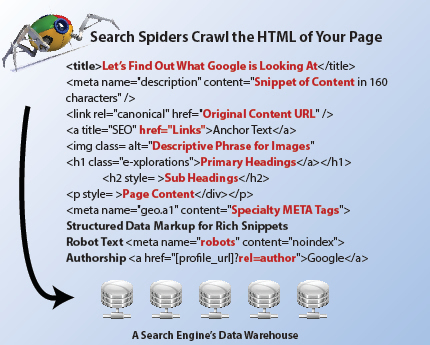 This tool will retrieve the two most important META tags for search engine success on your page and show them the way Google or Bing may present them. Wow, for this page, it appears your website does not rank anywhere in the first 50 results for the phrase “Insert Primary Keywords and Largest City” . If this is an important keyword phrase for your business, you have got some work to do first before your listing begins to appear in the top ten results of Google. It is possible another page on your website does appear in these results. We weren't able to complete your search at this time on Google. Please fill out the form below and we'll run a custom report for you instead. Do your primary keywords appear in bold? How about the city you selected? The Title and Description tags are the most important elements for each page. Consumers see these in search results…sometimes. They should be written in a way that entices searchers to choose your listing while also being keyword rich and relevant to the page copy. Contact us below if you are not pleased with what you see or the rank position. Do you want a few suggestions on how to improve your websites performance for this phrase?